Comber Street Studios are ideal for creative events such as exhibitions, fashion showrooms, launches, workshops, presentations, photo-shoots or filming. There are four main downstairs spaces and two smaller upstairs spaces in the building that can be hired individually or combined. We have furniture, props and limited photography equipment available for event use, most items can be included as part of the hire. Studio 15 is a locked space located on the ground floor of the main building complex. The sunny studio features original windows that overlook an outdoor garden area. Security - Lockable door & bars on windows. Access - from Comber St via front door/loading dock to the middle of the building. Gallery Lighting - flexible track lighting. Natural Light - abundant natural light, with translucent blinds for privacy. Hanging System - professionally hang paintings and pictures. The Annexe is a private locked space located on the ground floor of the main building complex. The sunny boutique studio is features original windows that overlook an outdoor garden area and air conditioning. Privacy - Separate from the main building, and generally quiet. Security - Lockable area within the studio space. Air Conditioning - reverse cycle air conditioning and fans. Kitchenette - Sink and cupboards for entertaining. Access - from Comber St via front door/loading dock and through the building corridor to the rear of building. Located at the entrance of the building, the Front Room features large glass window panes fronting Comber Street. Street Access - from Comber St via stairs. Natural Light - floor to ceiling glass windows with in-built seating. The Middle Room is located on the ground floor and is accessed via the Front Room, Middle Room and the Alley. The space has been used for exhibitions, photo shoots, fashion bookings and creative events. Controlled Light - limited natural light ideal for photographic shoots, screenings, presentations or installations. Event Space 3 is conveniently located on the ground floor with access via the roller shutter to Comber Street. The space features a kitchenette which has been used for exhibitions, sales and creative events. Natural light is limited which is useful for photo shoots. Controlled Light - natural light can be limited via roller shutter for photographic shoots, screenings, presentations or installations. Studio 5 is located on the first floor of Comber Street Studios. This locked, quiet room is ideal for showrooms, small workshops, private sales, presentations, consultations, small events and photo shoots. 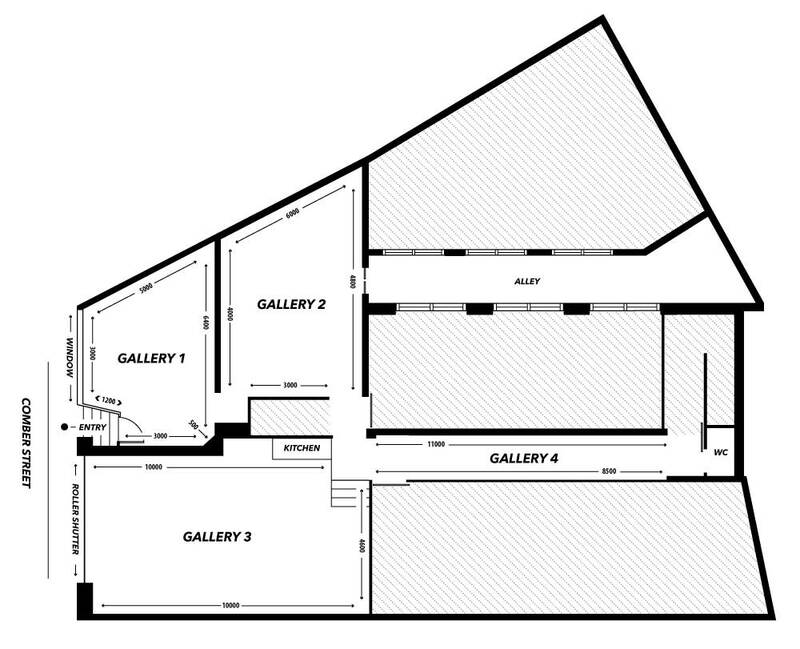 Studio 2 is located on the first floor of Comber Street Studios. The space is ideal for showrooms, small workshops, private sales, presentations, events and photo shoots.